IT was a ‘one in a million’ romance that ended in heartache. 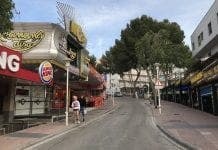 When an international appeal was launched to find rare snail Jeremy a mate, two would-be suitors – one from Mallorca – were dispatched to the UK. A rare genetic mutation means Nottingham-based Jeremy cannot mate with most females, whose shell spirals curl to the right in the opposite direction. “This snail is very rare. It’s a one in a million,” explained snail expert and professor Angus Davison in an appeal on BBC radio 4. 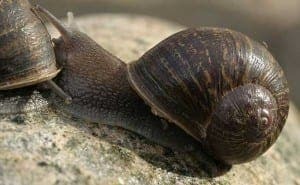 After Davison’s appeal however, another ‘lefty’ snail from Ipswich – called appropriately Lefty – and a Mallorca snail, Tomeu, were dispatched to the UK to try to help. Miguel Salom, who runs a snail farm and restaurant Sa Caragoelra near Binissalem, told the Olive Press how he found Tomeu. “I was working on the farm and saw the snail. It is really hard to find a snail like that, and if I hadn’t known about the appeal he would have ended up in the restaurant,” he said. When both fellow ‘lefty’ snails arrived in the UK, Jeremy thought his luck was finally in. But tragically for lovelorn Jeremy it was not to be… for the jet setting pair only had eyes for each other, leaving Jeremy on the sidelines. Tomeu and Lefty have now had their first offspring, producing some 170 baby snails, leaving poor Jeremy nursing a broken heart. Jeremy remains in his Nottingham home – but there may yet be a happy ending with Tomeu. “It would be fair to say they are getting on well, and have been ‘snail flirting’. No mating yet though,” Professor Davison told the Olive Press this week.